Apart from the ubiquity of Mariah’s Carey’s “All I Want for Christmas is You,” discussions about top-shelf holiday music don’t often revolve around seasonal selections from the 1990s. With the 1940s and 1950s being considered the pinnacle years for Christmas classics, multiple modern favorites from the 1980s getting heavy holiday radio play, and the current decade’s resurgence of every remotely popular recording artist producing at least one seasonal song all flooding the market with annual royalty-earning wannabes, it’s no surprise to find ‘90s music fans casting their trademarked, shoulder-shrugged “whatever” towards the whole situation. Forgetting the ‘90s on your holiday music soundtrack leaves a huge playlist of potential favorites out in the cold. However, there is a closely guarded secret to finding the decade’s strongest sonic stocking stuffers. Instead of looking for them out in the open of full-length holiday albums, you’ll actually find the best ones casually hanging out within the B-sides of random, non-descript singles. Whether it’s hiding on the dusty flipside of a 7” vinyl record or sprinkled within the extra tracks of a thin-cased Maxi-CD, your next new-to-you ‘90s jingle jam is patiently waiting to breathe fresh life into your holiday party playlist. To get you started, here are 15 Christmas and Hanukkah B-sides from the days Blockbuster Music, Must See TV, and all the free AOL CD-ROMs your mailbox can hold. Since irony and cynicism were evergreen characteristics of the ‘90s, “Everything’s Gonna Be Cool This Christmas” from Eels is a great place to start with the decade’s Christmas output. On its own, the festive song evokes an upbeat, arm-around-your-shoulder optimism driven by beautifully distorted guitars and pounding drums. However, when placed in context against its A-side (“Cancer for the Cure”) and the emotionally stark themes of the album from which the single came (1998’s Electro-Shock Blues), it’s hard to know whether frontman E’s rose-colored refrain is wishful thinking, confident projection, or denial-based satire. In true ‘90s fashion, the truth is probably lurking somewhere in the middle. Before the surprising mainstream success of “Stacy’s Mom” in 2003, Fountains of Wayne occupied a nice little corner of the alt-rock-meets-power-pop scene of the mid-to-late-‘90s thanks to their celebrated 1996 self-titled debut and 1999’s Utopia Parkway. In between those two albums, they released the non-album single “I Want an Alien for Christmas” on CD and green vinyl for the 1997 holiday season. Tucked away on the B-side is “The Man in the Santa Suit,” which tells the story of a down-and-out mall Santa that has just about had it with everything, most notably the hopped-up brats who can’t hold their root beer. It’s one of the band’s strongest songs and if you were looking for a single track that encapsulates the melodically rich sound and sly humor of Fountains of Wayne, you wouldn’t be wrong to go with this seasonal gem. 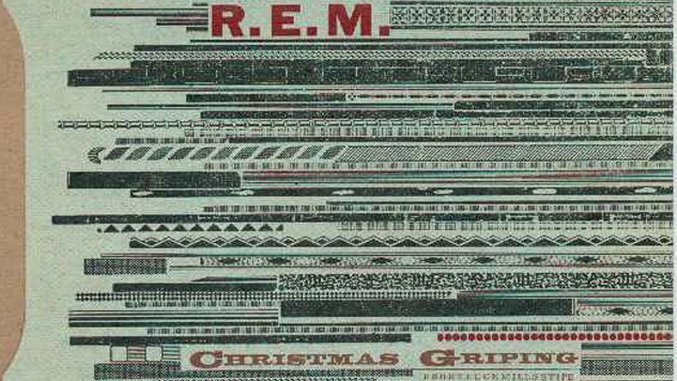 In what may be the unofficial anthem of Festivus, R.E.M.’s “Christmas Griping” is a whimsical tom-tom and sleigh bells fueled airing of grievances that features the Athens quartet offering their tongue-in-cheek list of Christmas complaints. All four band members take turns taking issue with the season’s usual suspects (fruitcake, malls, Burl Ives, department store Santas, and the like), but there’s also the bonus of Michael Stipe playing Santa’s little helper by providing a handy step-by-step recipe for s’mores. R.E.M. released a fan club holiday single every year from 1988 to 2011 and they often (but not always) featured a holiday-themed track paired with an inspired, left-of-center cover. For their 7” vinyl offering in 1991, “Christmas Griping” played the B-side to their A-side cover of the 1977 sing-along single “Baby, Baby” from U.K. punk band, The Vibrators. While the band’s annual single carried no guarantees that they’d attempt to conjure up their version of the Christmas spirit every single time, “Christmas Griping” is the high-water mark for what could happen when they decided to give it a try. In 1998, Save Ferris rode the international success of their ska-punk cover of Dexys Midnight Runners’ “Come On Eileen” into a starring role in a Japanese marketing campaign for Honda. The band recorded the song “Geba Geba! March” for the commercial (in which they also appeared) and even released a standalone single for the Japanese music market. For the B-side, Save Ferris released their interpolated cover of The Waitresses’ early ‘80s favorite “Christmas Wrapping.” While the music was pretty much just an amped-up-yet-played-straight take on the new wave holiday classic, lead singer Monique Powell cleverly “Hanukkah-ized” the lyrics and immediately time-stamped the late-‘90s song with mentions of Beanie Babies and a potential Madonna sighting at the Kabbalah center. With its crash course in yuletide Yiddish references (kugel, latke, tuchus, goyim, and “Christmas cards from friends who just don’t get it yet”), Save Ferris’ version of “Christmas Wrapping” might just be the best Hanukkah song since “Dreidel, Dreidel, Dreidel.” (And yes, that includes “The Chanukah Song” from Adam Sandler, which also gets a shout out in Save Ferris’ new lyrics). For individuals whose Venn diagram contains both Christmas music and Jon Bon Jovi, 1992 was a banner year. First, the sometimes-solo frontman recorded a cover of Charles Brown’s “Please Come Home for Christmas” for inclusion on the A Very Special Christmas 2 soundtrack, which also spawned a memorable music video of the tank-topped singer’s Christmas canoodling with fellow ‘90s notable Cindy Crawford. The same year, he and his band also released the original track “I Wish Everyday Could Be Like Christmas” as the B-side to their No. 1 hit single “Keep the Faith,” from their double platinum album of the same name. From the band that turned in a cover of Clarence Carter’s “Back Door Santa” on the first A Very Special Christmas, “I Wish Everyday Could Be Like Christmas” embodies the more romantic, sentimental thread of their signature string of power ballads from the ‘80s and ‘90s. Think “I’ll Be There for You” or “Bed of Roses” but with more church bells and mistletoe. Apart from anchoring one of the best Christmas sitcom episodes of the ‘90s (Fresh Prince of Bel-Air’s “Twas the Night before Christening”), Boyz II Men also placed their harmonious stamp on the decade’s Yuletide yield with their 1993 double platinum album Christmas Interpretations. The slinky, slow-burn “Let It Snow” was the album’s hit single that featured fellow R&B luminary Brian McKnight and locked down the year’s pop holiday radio playlists (thanks in small part to it being the final year of the pre-“All I Want for Christmas Is You” era). They released a physical single for “Let It Snow” and the B-side is a professional note-for-note instrumental version that quickly became the most played track at school talent shows and church recitals for years to come. Even now, being able to bust out an immediately recognizable, professional-sounding instrumental track for Christmas karaoke (instead of the tacky, overly-synthesized ones) is quite the mic-drop moment for any holiday party host looking to up their game. For additional uses, the track also pairs quite well with a quiet, candlelit dinner for two. For most Christmas music naysayers, it is the genre’s overabundance of sentimental schmaltz that seems to be one of the main points of objection. For those folks, Better Than Ezra’s “Merry Christmas Eve” is not going to be the track to change any minds. However, if you like your seasonal songs filled warm and fuzzy images of touching airport reunions, a snowy midnight mass, and Grandma saving the wrapping paper, then this jangly alt-light-rock ballad from 1995 is the band’s Secret Santa present hand-picked just for you. With lyrics like “Colored lights and mistletoe / Cinnamon and Nat King Cole / There’s a miracle now on 34th Street,” the song could easily be accused of being a little too on the nose. However, there’s something about the genuine earnestness of vocalist/guitarist Kevin Griffin’s delivery that makes it all work. The song is also notable for being one of the ‘90s songs that heavily feature a saxophone, calling to mind that era of the decade when Dave Matthews and Edwin McCain spearheaded attempts to return the instrument to the height of its former ‘80s glory. “Merry Christmas Eve” can be found on the band’s CD single for “Rosealia,” the third single (after radio hits “Good” and “In the Blood”) from the band’s 1995 breakthrough major label debut, Deluxe. Doubling down on their Orange Country cred, No Doubt covered “Oi to the World!” from Huntington Beach punk legends The Vandals for the B-side of “Happy Now?,” their fifth single from 1995’s Tragic Kingdom. Released in 1997, No Doubt gave the song their signature ska-punk flavor with up-strummed guitars on the verses, a bubbly bass breakdown, and some festive wailing from their horn section. Not only did No Doubt accomplish the feat of adding their unique stamp to a cover of an already top-notch song, but it’s also just an incredibly fun Christmas song that never runs the risk of overstaying its welcome (especially considering its less-than-three-minutes run-time). No Doubt’s “Oi to the World!” cover also appears on the third installment of the A Very Special Christmas series alongside Blues Traveler, Mary J. Blige, Sheryl Crow, Hootie & the Blowfish, and a version of “Santa Baby” featuring Mase, Puff Daddy, Snoop Dogg, Salt-n-Pepa, Keith Murray, and Onyx, which is pretty much the most ‘90s thing ever. Beck’s celebrated 1996 album Odelay was spilling over with adventurous tracks like “Where It’s At,” “Devil’s Haircut’” and “New Pollution.” At the same time, he also had an abundance of equally inventive numbers like “Clock” that never made the album’s 13-song tracklisting. “Clock” was tacked on as the “secret song” to a few international versions of the album and it also got it’s own standalone release (though technically as a non-album single). For the B-side to “Clock,” Beck included his experimental Hanukkah-themed “Little Drum Machine Boy.” Featuring Beck’s penchant for analog drum machine beats, obscure sample snippets, and playful non sequitur lyrics delivered through a laid-back half-sung/half-spoken vocal delivery, “Little Drum Machine Boy” has all the hallmarks of an unconventional Beck B-side. There’s even a vocoder-effected, robotic reading of the Hebrew blessing “Baruch atah Adonai Eloheinu melech ha-olam” serving as the song’s repeating hook. That’s the holiday robot funk, you guys. Yes, The Beatles released new music in the ‘90s. As part of their mid-decade Anthology documentary and three-part album event, Paul, George, and Ringo (with a little help from Jeff Lynne) took two John Lennon home demos and fleshed them out with additional instrumentation and full-band vocals to create the “new” Beatles songs “Free As A Bird” and “Real Love.” “Free As A Bird” was released in November of 1995 as an official single to coincide with the TV airing of The Beatles Anthology and the release of the Anthology 1 album. Being so close to the holidays, the cheeky lads from Liverpool chose a seasonally appropriate B-side, a tightened-up version of their 1967 fan club single “Christmas Time (Is Here Again).” Trimming back some of the loose, nonsensical skit moments from the original version cut the song’s run-time in half, which allows the listener to have more of an opportunity to revel in the flawlessly infectious chorus. Don’t worry, they kept each member’s personalized holiday greetings and left in that old holiday lyrical chestnut, “O-U-T spells, ‘out.’” Thanks, Ringo. While some Weird Al apologists may cry foul on this pick since “The Night Santa Went Crazy” is actually the closing track to his 1996 Bad Hair Day album, its inclusion on this list is due to this being the lyrically-altered “Extra Gory Version” that was used as the B-side for his wildly successful “Amish Paradise” single. Leave it to Weird Al to back one of his most popular mainstream single releases with a track about a gun-toting, murderous Santa Claus running rampage on the North Pole. In the Bad Hair Day version, Santa ends up just going to jail for his transgressions, while the “Extra Gory Version” presented on the single sees St. Nick receiving a bullet to the head courtesy of a SWAT team member. The song is also notable for highlighting one of Weird Al’s less talked about genius-level talents, which is masterfully evoking just the essence of a song or artist without creating a note-for-note copy. For this one, Weird Al and his band nod to Soul Asylum and their 1993 hit “Black Gold,” all the way down to the police-siren, chaotic radio chatter bridge breakdown. If pop-punk heavyweights Blink-182 are going to record a Christmas song, there’s no doubt that it’s going to be a fun and subversive take on the traditional elements of the season. “I Won’t Be Home for Christmas” spins a yuletide yarn of one man’s not-so-silent night in jail after taking a baseball bat to a group of carolers (or “Satan’s Helpers,” as singer/bassist Mark Hoppus affectionately calls them). All of the genre’s trademarks (fast tempos, hummable guitar-and-bass riffs, snotty vocal delivery) are present and accounted for in “I Won’t Be Home for Christmas,” with the added holiday spice of a “Deck the Halls” choral intro, chiming church bells, and the closing lyrical tag “I won’t be home for Christmas, please post my bail.” Their self-penned holiday original was released as one of the bonus B-sides to “Josie” (the fourth single from 1997’s Dude Ranch) and it soon became an alt-rock Christmas compilation mainstay. As an odd bit of trivia, this song became Blink-182’s only Canadian No. 1 hit when it was re-released as its own A-side single for the 2001 holiday season, spending a total of six non-consecutive weeks fighting for position against U2’s “Stuck In A Moment You Can’t Get Out Of” and Enya’s “Only Time” at the top of the Billboard Canadian Singles Chart. What’s more ‘90s than TLC placing their unique R&B/hip-hop stamp on an updated version of “Sleigh Ride” for the Home Alone 2: Lost in New York soundtrack? How about the innovative trio releasing a remixed B-side version that swaps out the pop polish of the original with a bass-bumped, G-funk swing courtesy of producer Colin Wolfe. At the time, Wolfe was fresh off working with Dr. Dre on his magnum opus The Chronic and his sonic influence is readily apparent. The CD single of TLC’s “Sleigh Ride” actually features multiple remixes of the holiday track for its B-sides, but this one stands out as the stellar entry in the group (as evidenced by it being given the opening A-side slot on the 12” vinyl release). Both of Left Eye’s rapped verses, while still cool to hear on the Home Alone 2 version, truly find their sweet spot in the synthesized funk and deep bass grooves of Wolfe’s remix. While it’s understandable why the soundtrack’s producers would’ve gone with the safer, more mainstream version of the track to sit comfortably alongside cuts from Darlene Love and Alan Jackson, the remix is the hands down, ready-made choice for taking your Christmas party to the next level. When Tori Amos released the emotionally dense “Spark” as the first single from her 1998 album From the Choirgirl Hotel, her choice of “Have Yourself A Merry Little Christmas” for the B-side proved to be a bit of a head-scratcher. The single wasn’t even sold around the holidays, instead coming out just a few weeks before the album’s May release. However, her tender and atmospheric rendition of the Meet Me in St. Louis ballad is so graceful in its piano-led delivery and so faithful to the melancholy air of the original, that it makes the timing logistics surrounding its release irrelevant. For fans of Amos’ moving warble and wail, this B-side was one of the rare Christmas songs the singer officially released before going all in on the holiday with her 2009 seasonal album Midwinter Graces. While From the Choirgirl Hotel marked a sonic change in Amos’ music to a louder, fuller band sound, this quieter Christmas B-side harkened back to the sparse piano arrangements that fans had flocked to on her first three albums. A couple of years before Low released its Christmas EP, the don’t-call-us-slowcore indie rock band tested the waters with a 7” vinyl Christmas single featuring “If You Were Born Today (Song for Little Baby Jesus)” on the A-side and a wonderfully unhurried cover of “Blue Christmas” on the B-side. While the sometimes-shared-sometimes-split vocal duties of Alan Sparhawk and Mimi Parker—the married duo at the heart of Low—characterize the band’s sound even more than their (usually) slow tempos and (usually) meager instrumental performances, it is Parker that handles the molasses slink of their turn at “Blue Christmas” alone. Her beautifully dour delivery treats the somber heartache of the lyrics in a way that Elvis (and his schmaltzy background singers) never quite seem to tap in to for the most popular version of the song. Between Parker’s leisurely vocals and Sparhawk’s deceptively simplistic guitar solo, Low’s “Blue Christmas” is always in the running for saddest Christmas song ever.